So somehow I managed to finagle a two week trip ALL BY MYSELF to India last month. I’m not quite sure how it happened – but it had something to do with my darling husband and somehow all the stars aligned and before anyone could say “Mommy!” I had booked a ticket. It’s like therapy for my soul – I miss the food, I miss the people, I miss the country. A Hanyuman temple in the middle of a busy street. Luckily I got my fill of two weeks and am ready to hit the ground running for summer 2014! 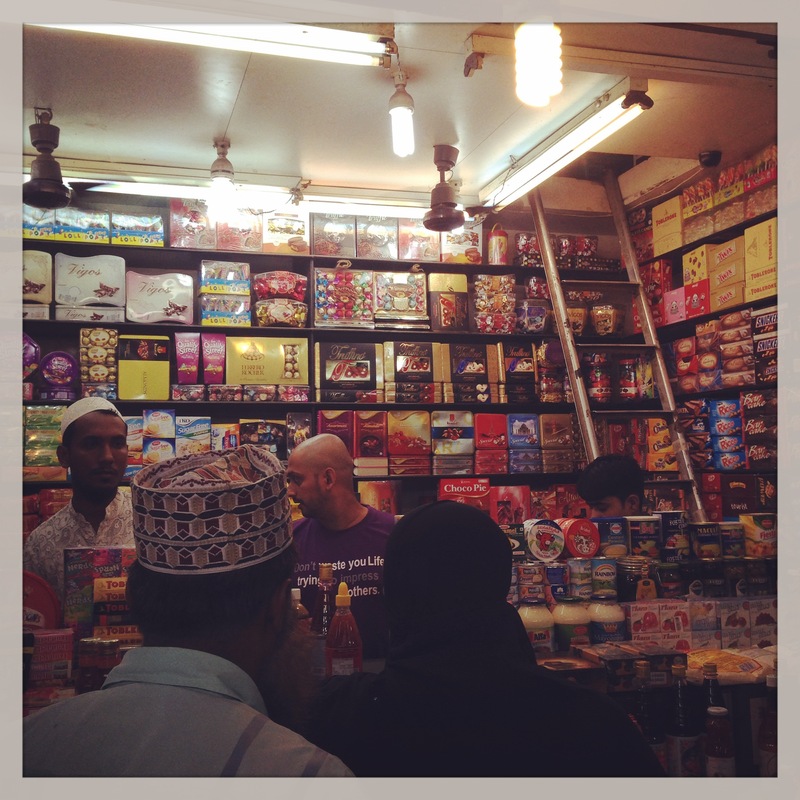 Let’s talk about some of the delicacies I experienced over there. 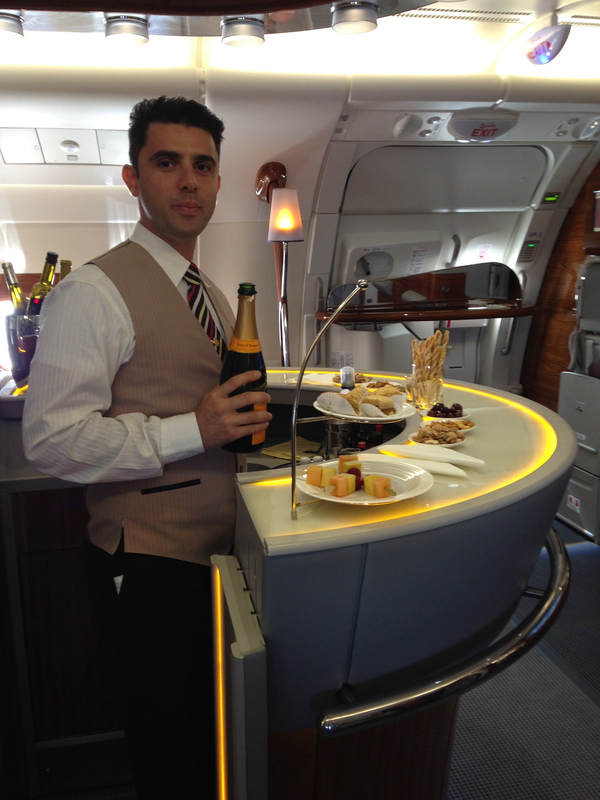 Well, before we get to India I feel I need to mention Emirates Airlines and the sheer ridiculousness of their awesomeness. I got a ticket last minute and because we have a gajillion miles I upgraded myself on some of the legs. Well I did not know what I was in for. 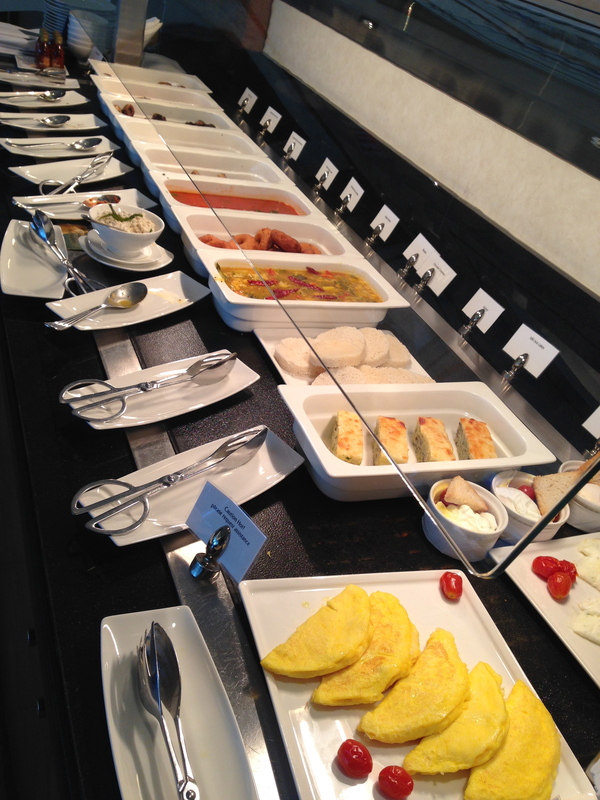 This was the breakfast scene at the airport (my flight left at 11am so this was about 9:30am). I wasn’t even hungry but I couldn’t help myself. 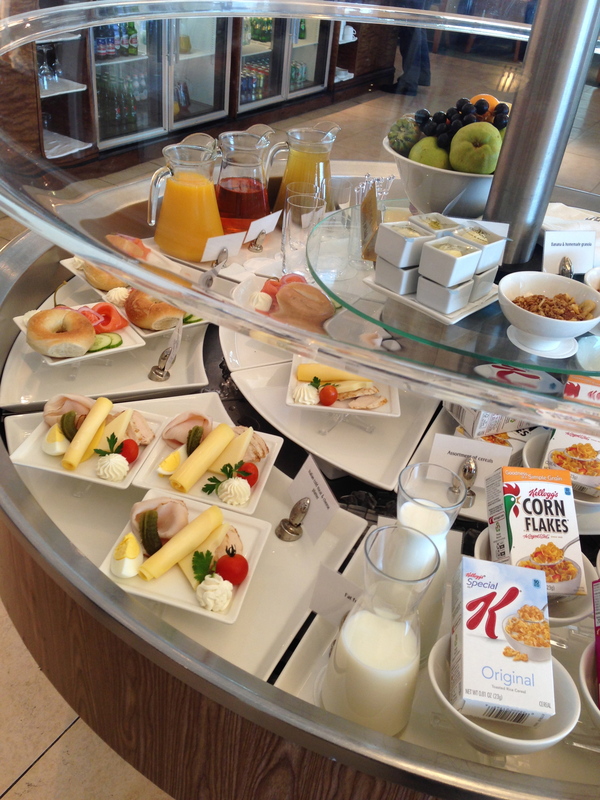 What is it about the psychology of buffets? Can someone please explain this phenomenon? 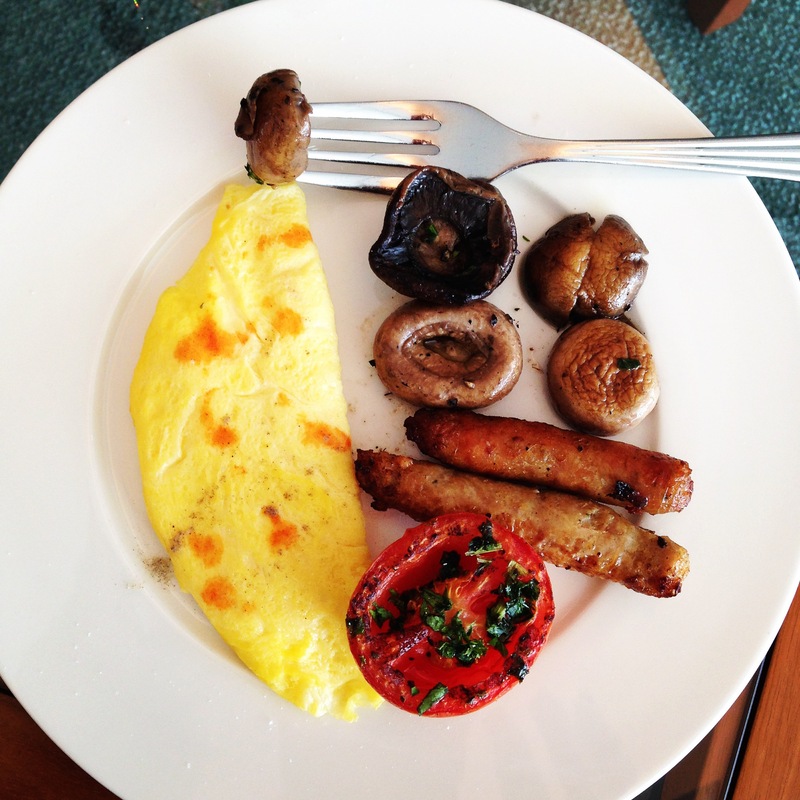 I never even eat breakfast but somehow was powerless against the draw of the buffet and had to throw down a breakfast. And VC for brekkie? I restrained myself. I still had a 14 hour flight to get through. This was ON THE PLANE! There was an actual bar and lounge. OMG. I thought to myself, “This plane doesn’t even have to leave the tarmac – this is enough!” A bed, George Clooney movies and champagne. It was already a vacation. Since it was now 10:30 I thought, why not? And that was the start to the most blissful transatlantic flight I have taken and sadly, probably the last. 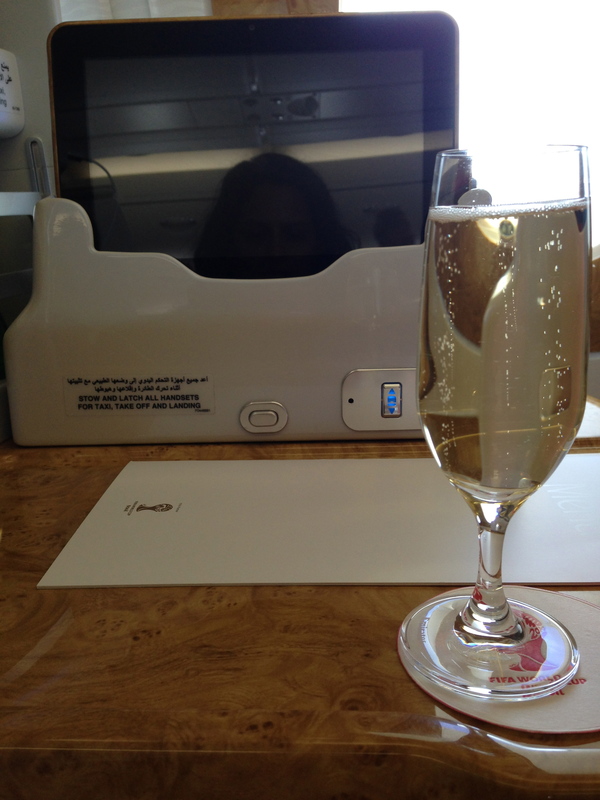 Let me tell you I had a bit of a rude awakening when I had to fly economy on the next leg. I know, I know – cry me a river. 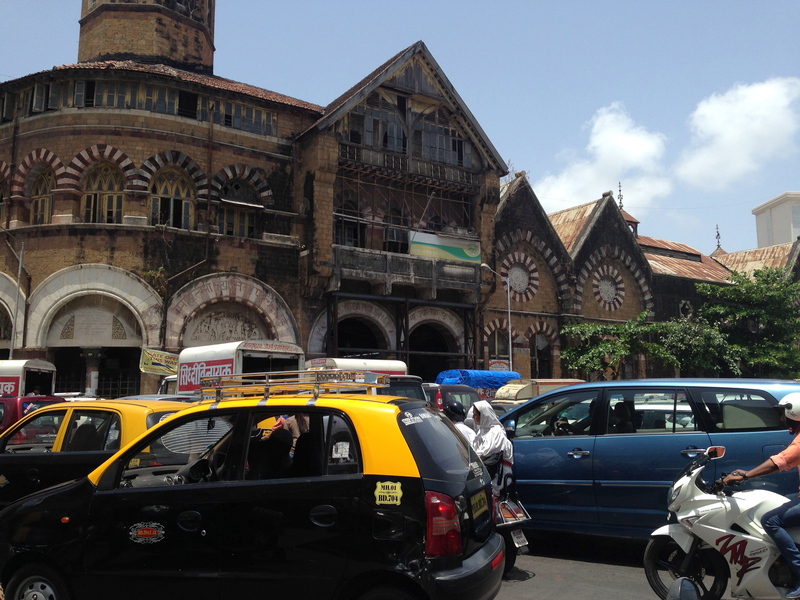 My first stop was Mumbai. I love Mumbai. It is a large bustling metropolis surrounded by water. Sound like a city you know and love already? You betcha! It’s the NYC of India. This is me trying to cross the street at Crawford Market. While taking a video. Probably not the best idea. Pretty hairy, huh? Well I did safely make it across. It’s funny how in all the chaos there is beauty and things actually work. 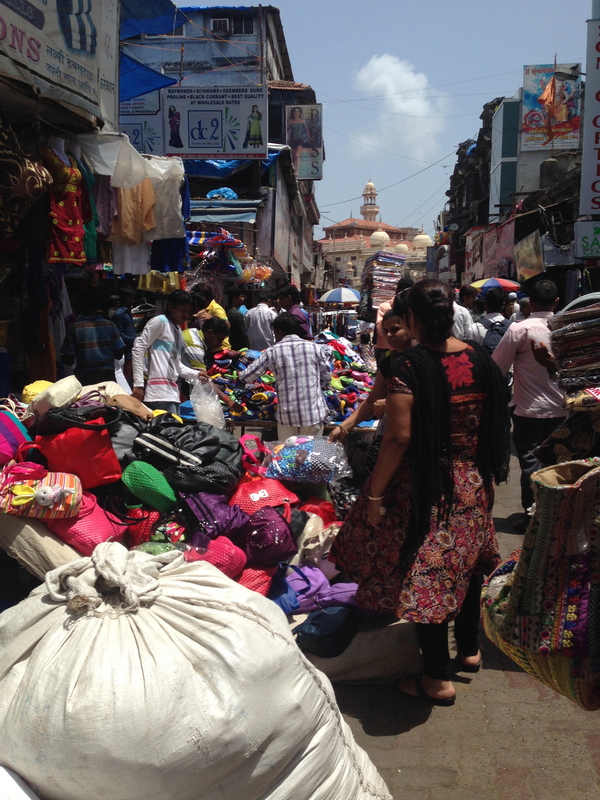 Crawford Market is one of Mumbai’s most famous markets. It was completed in 1869 and architecture is a blend of European styles. You want to buy a puppy? or a chicken? 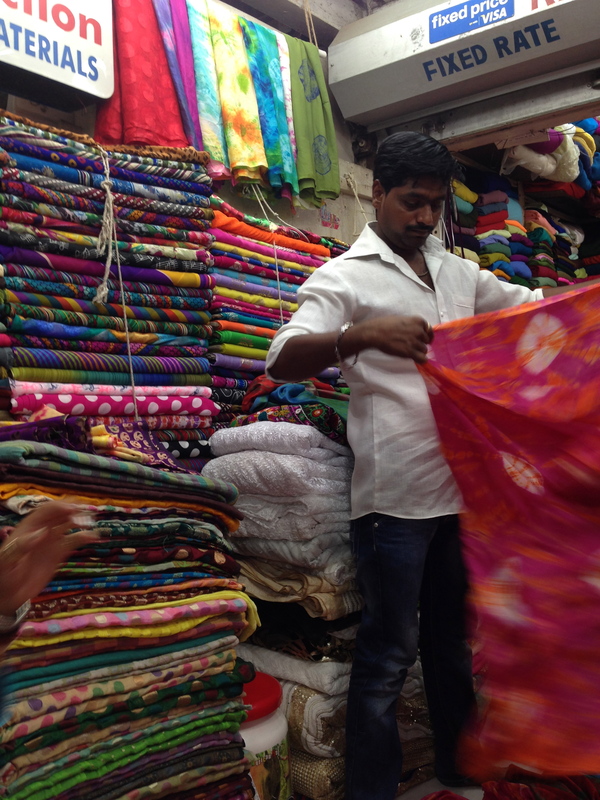 You want fake Croc’s or a sari bag? You want any kind of fruit or veggies you can think of? Quality Street candies? This is your place. Everything is here. Somewhere. 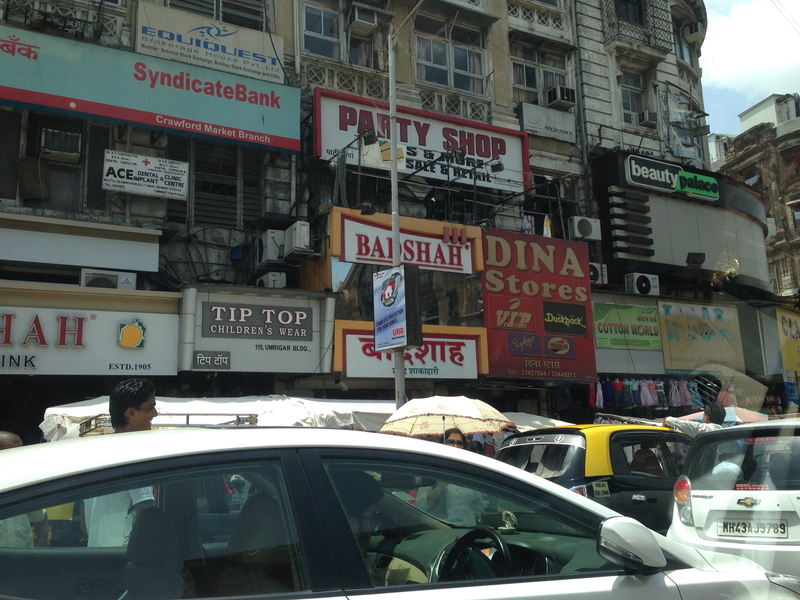 To fortify ourselves in the midst of all the shopping we stopped at a very famous falooda place – Badshah’s. Never had a falooda? Well, you are in for a treat. If you can find one here (let me know if you do!). 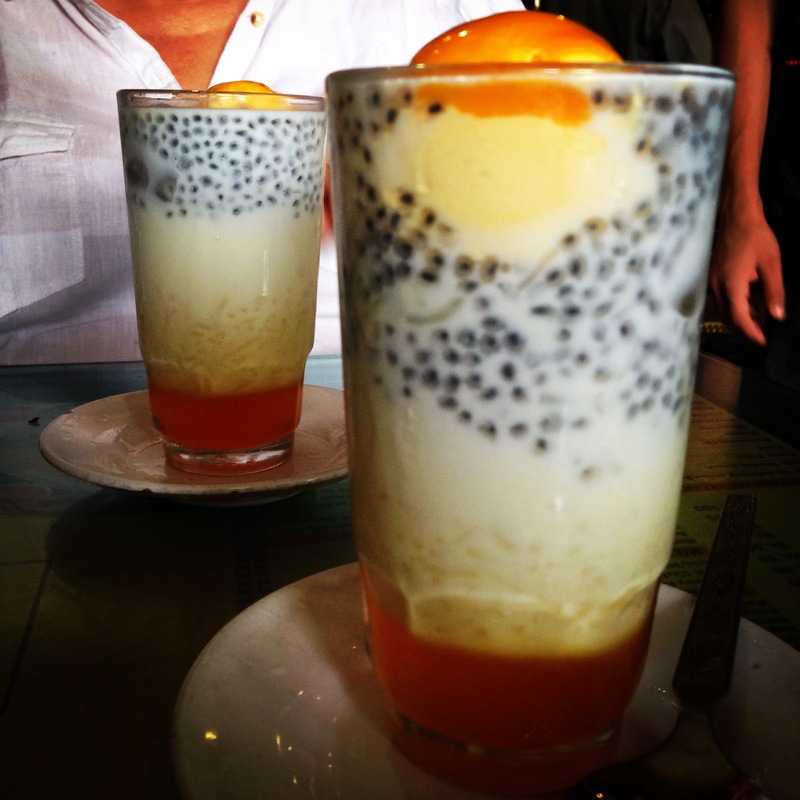 It’s basically a flavored syrup with vermicelli noodles, milk, chia seeds and ice cream. Whoa! I know it sounds like a lot going on but man – it’s delish! It’s basically a not-very-healthy smoothie-like drink you eat with a spoon! Well it does have chia seeds so maybe that negates some of the naughtiness. Eh, who cares? 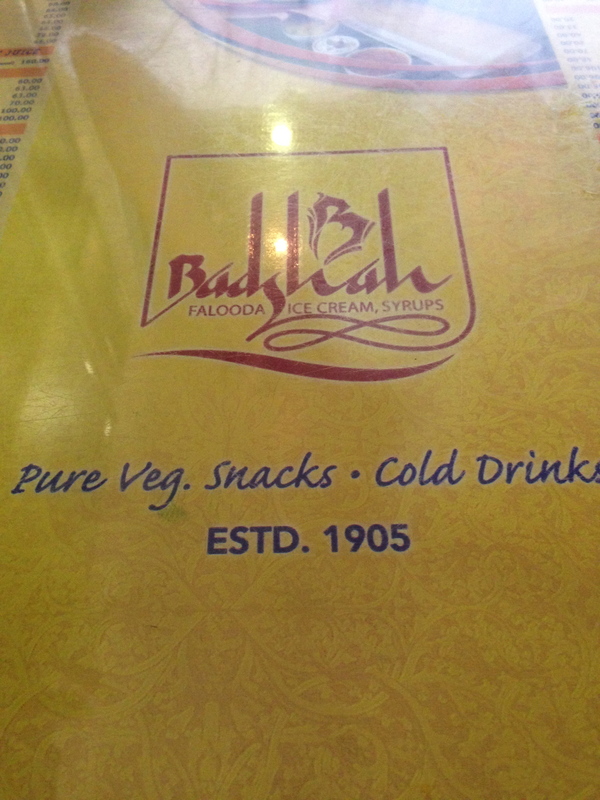 Badshah’s has been doing this for over 100 years so they seem to know what they are doing. 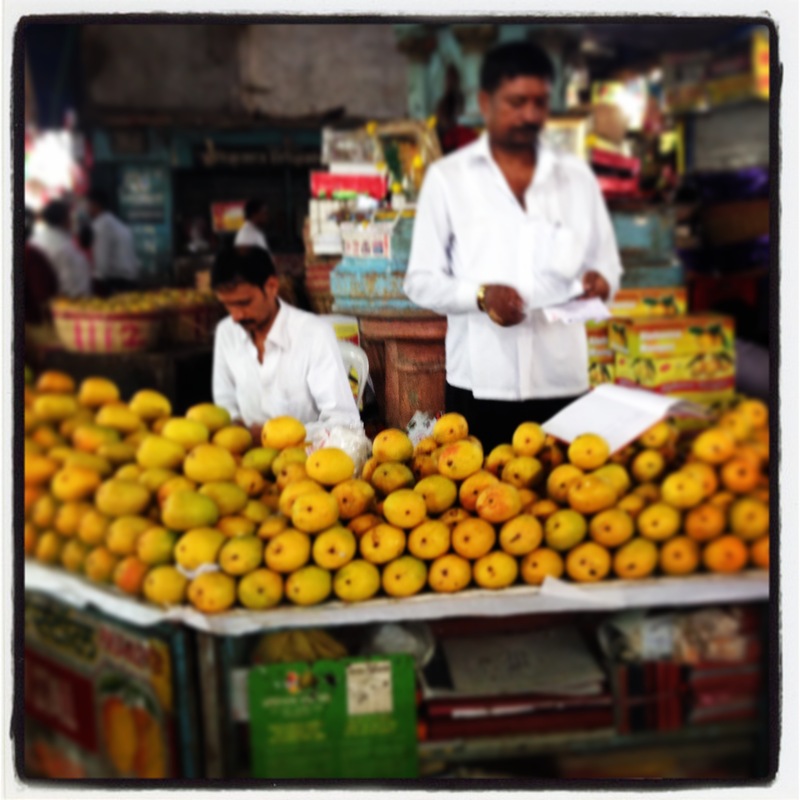 Check them out next time you are in Mumbai! 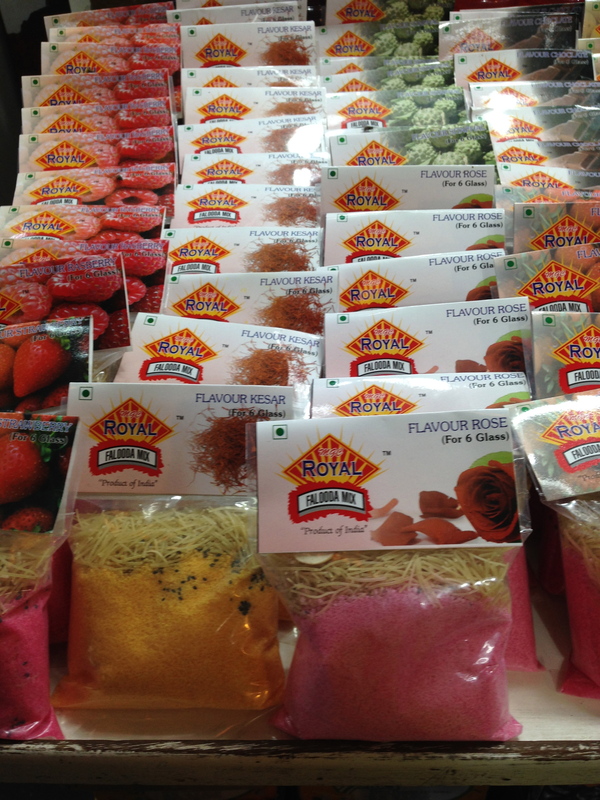 Or visit Crawford Market and take home a mix! 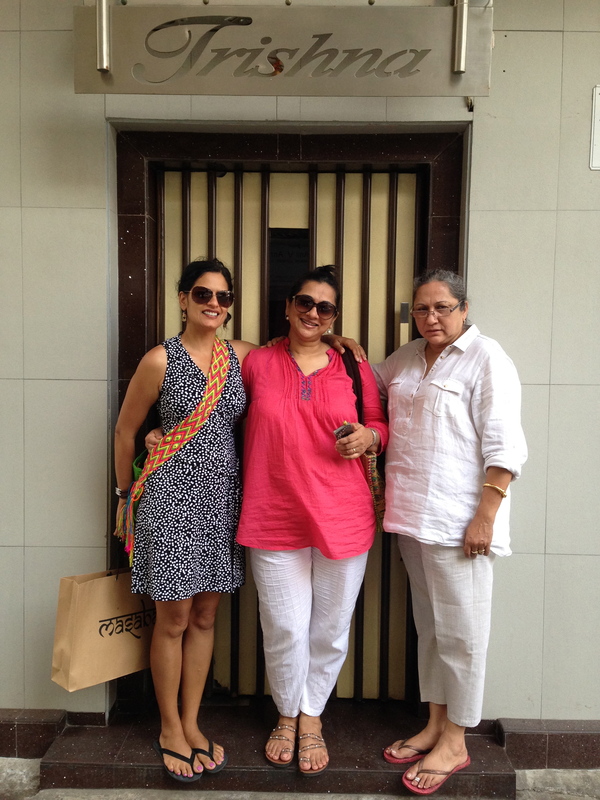 We spent one glorious lunch at Trishna’s. I was so excited to eat there that I forgot to take any pics of the food! They are one of the best known sea food restaurants in India and some say the world. The inside looks like a drab conference room but people come here for the food, not the ambiance. We weren’t very hungry so we just had a simple lunch of Butter Pepper Garlic Crab and thin butter naan, but Oh momma. If ever I was on death row this would most certainly be my last supper. Just perfection. I didn’t want to eat dessert lest the flavors left my mouth. And you know me, when do I not eat dessert? Twice? It is that good. 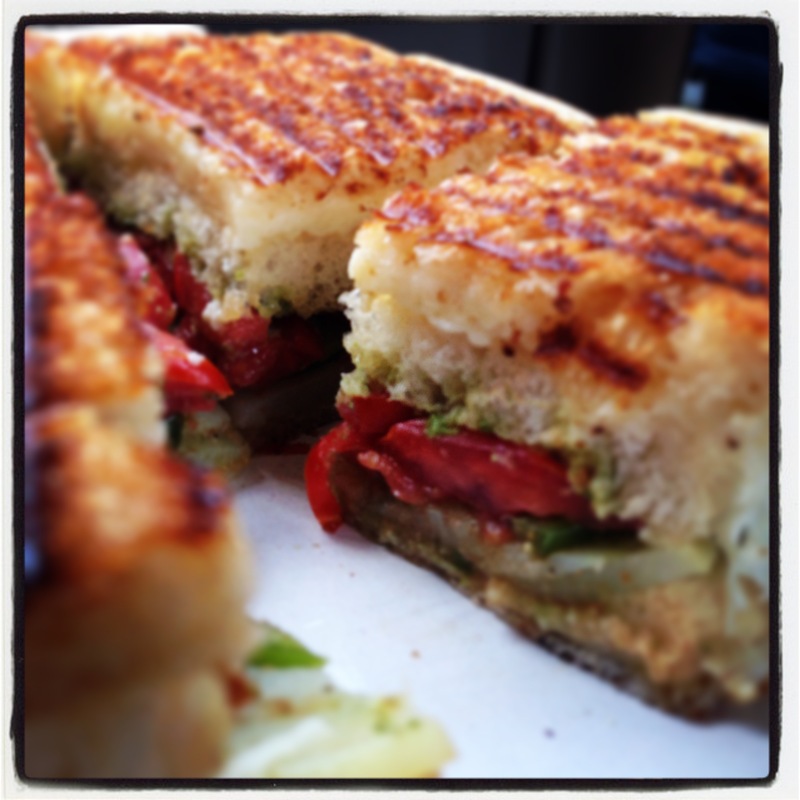 for the famous Mumbai sandwich! Somehow I have lived 40 something years and have never had one of these! 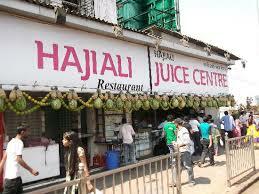 We stopped at Hajiali which is next to a mosque in the sea behind it. It happened to be high tide so the walkway was covered in water and no one could get to the mosque! It was quite a sight to see. 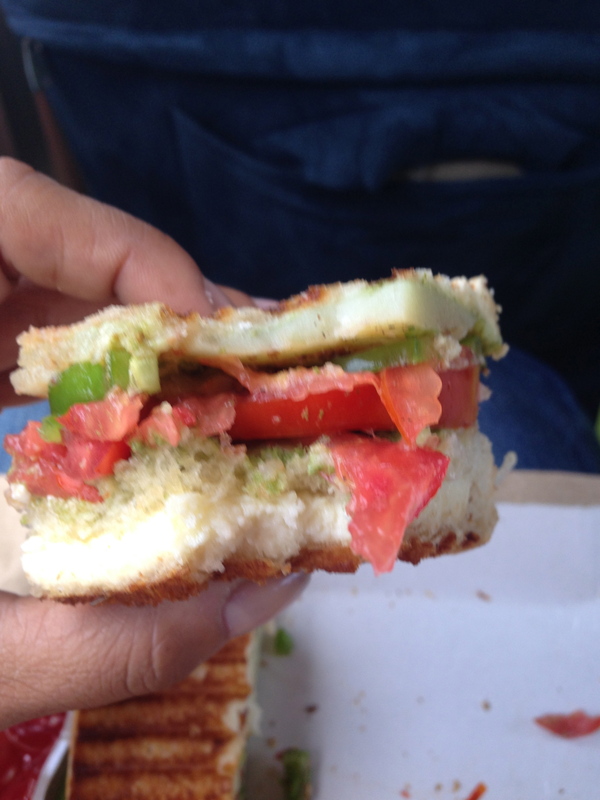 So we had to fight some serious crowds to get our Mumbai sandwich! But it was worth it! 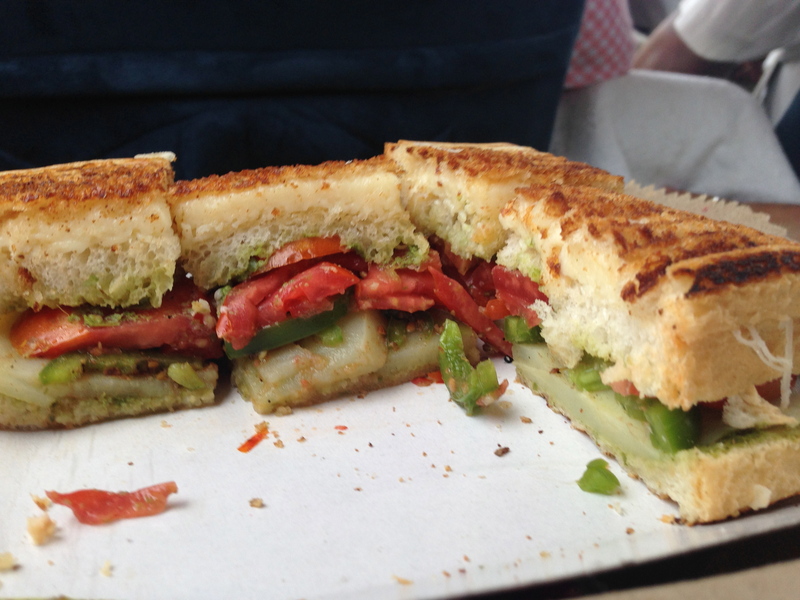 This sandwich is not fooling around – triple decker, layered with grilled veggies, cheese, potatoes and chutney. 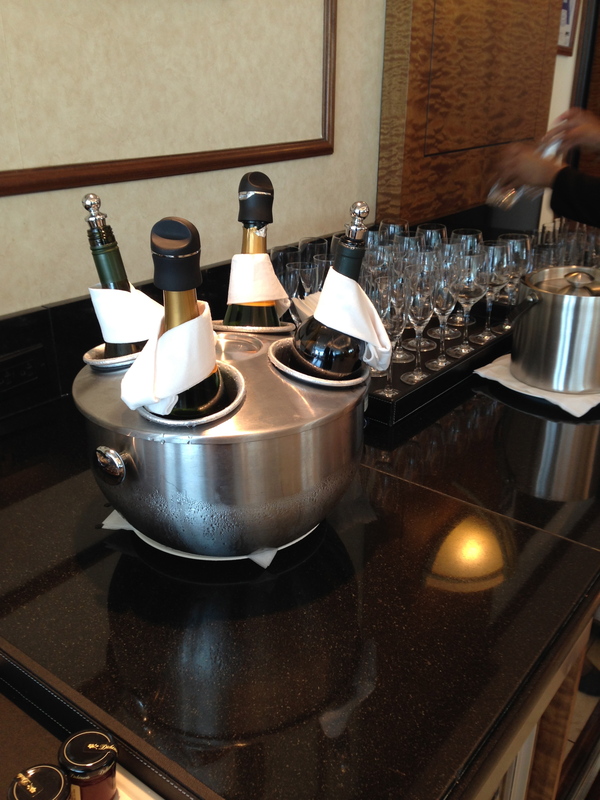 A perfect send off to a perfect Mumbai visit! PART II Incredible India coming soon!!! !